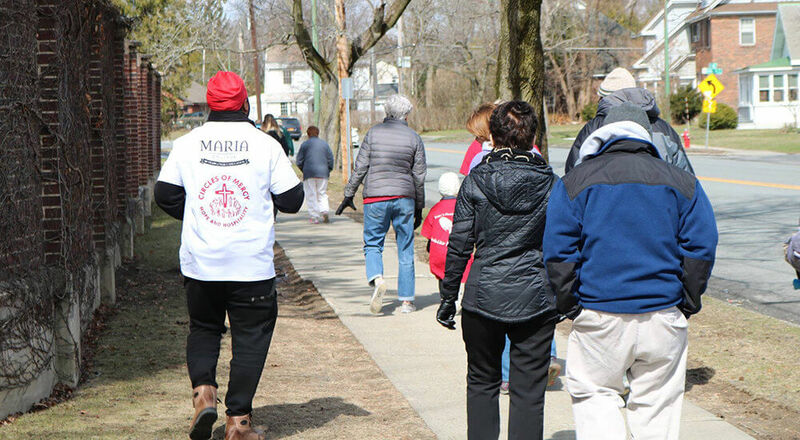 ALBANY, NY, March 21, 2019 –Circles of Mercy and Maria College are co-hosting the 2019 Walk for Mercy on Saturday, April 6 from 11am to 2:00pm. The walk will start at Maria College located at 700 New Scotland Avenue in Albany, NY. This fundraising event benefits low-income and disenfranchised families and individuals, including women and women with children. Proceeds will be shared between Circles of Mercy and Maria College, the only locally sponsored ministries of the Sisters of Mercy. The walk course is 2K (1.24 miles) in length and is a free event. Tee shirts will be given to the first 50 walkers and refreshments will be provided. The Walk for Mercy begins and concludes at Maria College Marian Hall, where individuals will have the opportunity to participate in a raffle prize drawing. Circles of Mercy, 11 Washington Street, Rensselaer, NY 12144. You may also visit the Circles of Mercy website at: https://www.circlesofmercy.org and click on “Make a Donation” and use the secure PayPal link. All contributions are tax deductible. Parish of St. John the Evangelist and St. Joseph, MicroKnowledge, Modern Press, Church of St. Mary, and the Renaissance Corporation. Circles of Mercy has a 21 year tradition of providing services to the local Rensselaer Community to instill hope and empower individuals to reach their full potential in the spirit of the first Sister of Mercy Catherine McAuley. Drawing upon the Gospel and the spirit of Catherine McAuley, Circles of Mercy’s mission is to improve the quality of life in the community by working to end the cycle of poverty, especially among women and women with children. Founded in 1958, Maria College is one of 17 colleges and universities in the United States sponsored by the Sisters of Mercy of the Americas. The private, co-educational, Catholic college in Albany serves approximately 800 students in a variety of degree and certificate programs including liberal arts, psychology, healthcare management, nursing, and occupational therapy. With an unwavering commitment to the humanities, the College instills in its graduates a respect for the dignity of each person and the ability to transform learned skills into caring service.